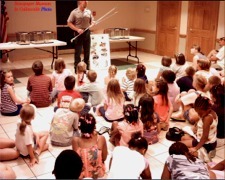 Skiatook Lake Park Ranger Greg Bersche shows a snake to the crowd of children (& parents) at the Collinsville Library July 29th. 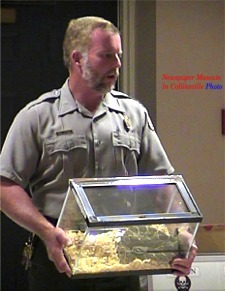 Ranger Bersche led the kids through a series of true/false questions to teach them the basic about snakes. 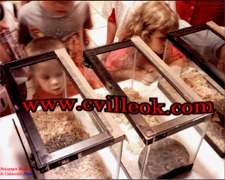 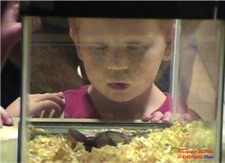 After the discussion the kids were able to view the 6 local Oklahoma snakes in their traveling aquariums. 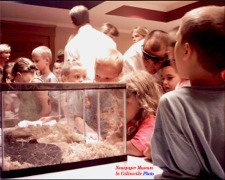 Bersche said the Rangers typically did 7 or 8 programs a year like this at schools and libraries. 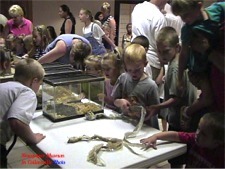 They also have programs about water safety and general wildlife. 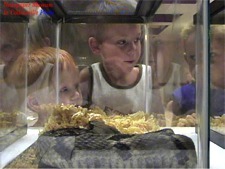 The dried snake skins were the only "snakes" outside their cages at the Library.